A mathematical multicurrency trading system based on the principle of a neural network. It uses a general database of algorithms "S1M1" consisting of the most stable trading algorithms in its work. Before getting into the "S1М1" general database of algorithms, each block of conditions has passed the testing for stability with the identification of certain market dependencies for that block. A network created in such a way allows the EA to automatically select the most optimal variant of response to the market situation from numerous possible variants of algorithms included in its database. The EA algorithm consists of two independent trading modes. The first one does NOT use the risky systems of martingale and averaging, all trade positions are always protected by Stop Loss. The second one uses a unique smart multistage averaging system. There is no need to optimize the EA, it is already fully configured for work. The starting deposit is $10 and higher. All 3 pairs pass tests from 2009 to the current time (8 years). No need to close the robot during news releases. Estimated spread is from 2 to 3 points (4 digits). Estimated Take Profit is 40 points (4 digits). Currency pairs: EURUSD, GBPUSD, AUDUSD. Start time: the EA should be activated before the start of a new trading week. It is not recommended to activate it at another time, within a week. Performance was tested on 5-digit quotes. For the EA to trade on all 3 pairs, it should be attached to a chart of each pair. The recommended deposit size for trading one pair with the initial lot 0.01. 1000 USDC - cent account. 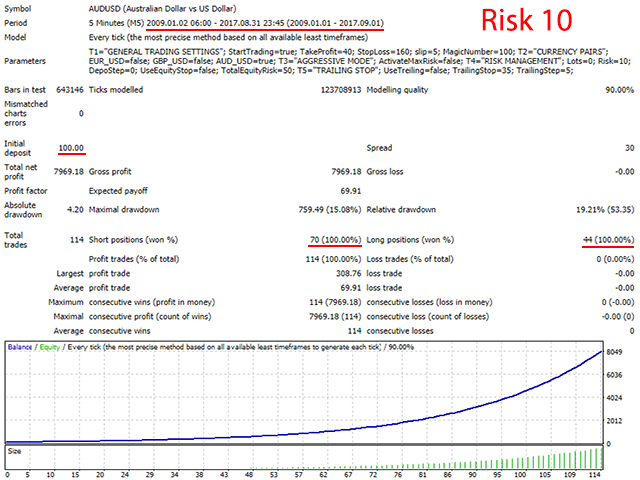 Risk - 10 (automatic increase of lot, as an alternative to the initial lot 0.01) - increased risk. DepoStep - 1000 (automatic increase of lot, as an alternative to the initial lot 0.01) - increased risk. The recommended deposit size for multicurrency trading with the initial lot 0.01. Risk - 3 (automatic increase of lot, as an alternative to the initial lot 0.01) - increased risk. DepoStep - 3000 (automatic increase of lot, as an alternative to the initial lot 0.01) - increased risk. StopLoss - stop loss value, depending on the trading style. Pairs: EUR_USD, GBP_USD, AUD_USD - activate trading on the selected currency pair. The EA should be attached to a chart of the selected currency pair. Activate of support orders - activate the function for managing additional orders. Lots - initial lot size. It is activated, if the values of Risk and DepoStep are zero. Improved the quality of entries.